We booked one day tour to Mount Fuji and Hakone in Jakarta without checking the weather forecast before hand. Only on Monday we realized that the day we picked was the only day in a week where rain would be forecasted to fall. It turned out the weather forecast was correct. When we left Tokyo it was cloudy, and the rain finally fell when we about to arrived at Mount Fuji area in Yamanashi Prefecture. The guide told us the road to Mount Fuji 5th station was closed because of heavy snow fell in the area last week, so the farthest station we could reach was only the 1st station. Alas, on 1st station it was cloud all over Mount Fuji. So we couldn’t have any sight to the famous “mountain of fire”. 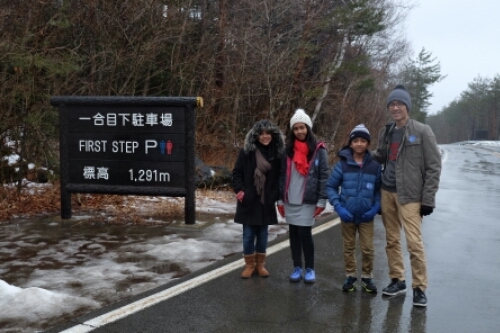 Our family picture on the 1st station sign above, was the best and closest location we had for Mount Fuji. LOL. 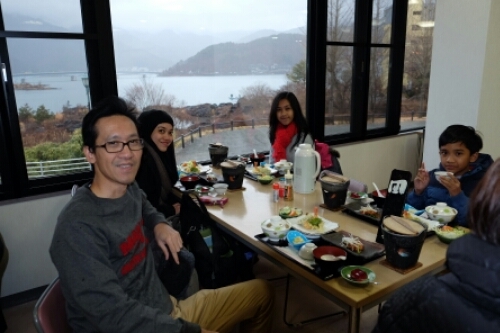 And then the day became worse, as the guide heard the news that it was raining hard in Hakone and also it was very windy, resulting our booked cruise and cable car ride there was cancelled. Oh my. But, good thing, the tour had alternative plan. So we went down to Kamaguchiko, a small town near Kamaguchi lake (a beautiful town side lake, by the way), and we took the cruise in Kamaguchi lake and also Kachikachi-yama Ropeway to the observatory, where we can have very good view of Lake Kamaguchi and (supposedly) Mount Fuji from the altitude of 1,075 meters. 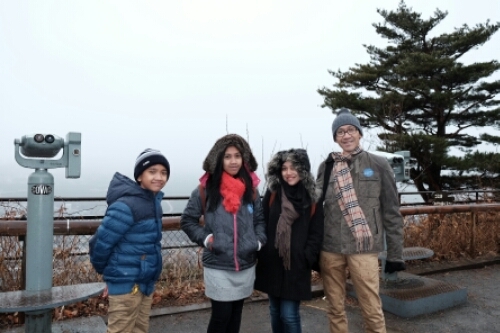 All in all, it was all still good experience (well, travelling with your family is always a good experience itself! 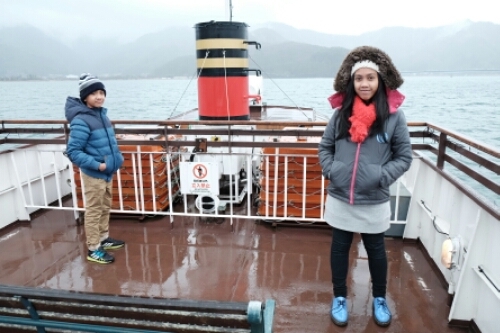 ), the scenery was fine, the cruise and ride were nice as well. Alhamdulillah. But I couldn’t help to wonder how good the scenery would be should the Mount Fuji have been on sight. Judging from Instagram pictures taken surrounding the area, it was superb! Sigh. 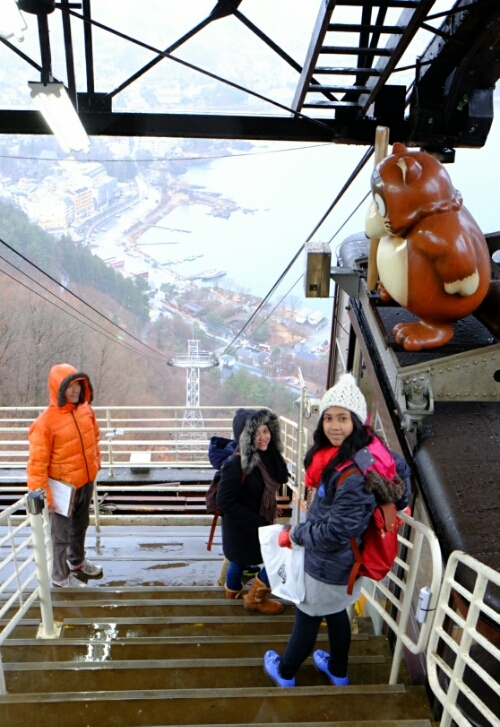 Taking the cable car to observatory. 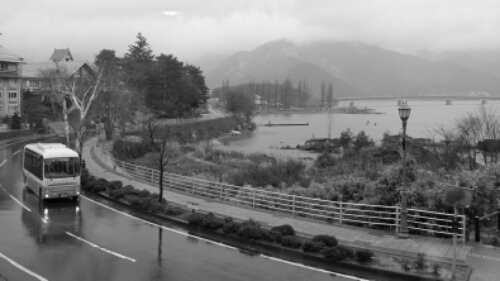 Look at the stunning scenery of Lake Kamaguchiko below. Well, maybe it’s not our luck to be able to see Mount Fuji this time. Probably a sign to come back here, sometimes in the future. Probably best at spring time. And we should remind ourselves: don’t forget to check the weather forecast beforehand!